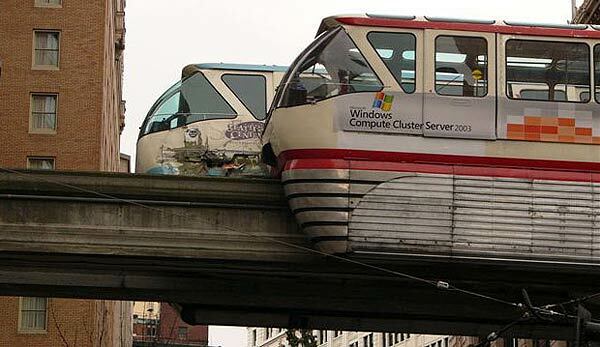 Once upon a time there was a monorail. It was built for the Seattle Century 21 World's Fair of 1962. Millions of passengers were carried between the fairgrounds and a downtown station, a station that straddled over Pine Street. Above are two postcard images of that downtown station. 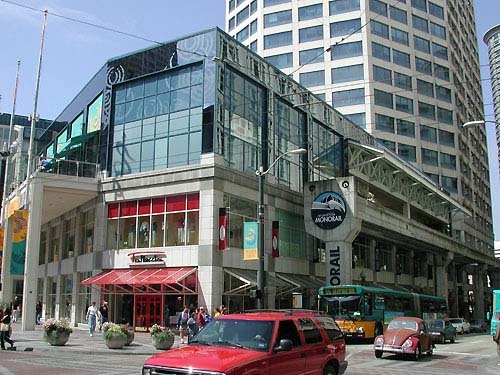 After the fair, the station remained, as well as the monorail, and for years the monorail continued to carry passengers from downtown to what is now called Seattle Center. 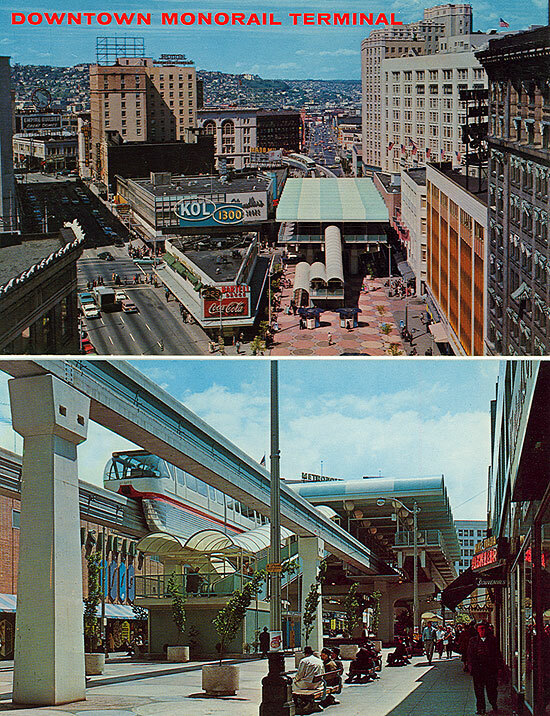 In the late 1980s, the downtown monorail station was torn out to allow developers to build a large new complex known as Westlake Center. To keep the monorail operating, it was decided that a new station could be squeezed onto the side of the complex. An idea for allowing the trains to enter directly into the new center had been rejected because of the space it would require. To avoid covering the street below, the two new sections of track that hugged up to the side of Westlake Center were pinched together tightly, which would now only allow one train to be parked downtown at a time. No such limitation existed before, and now drivers would be required to always be aware of where the other train was to avoid a collision at the pinched track. 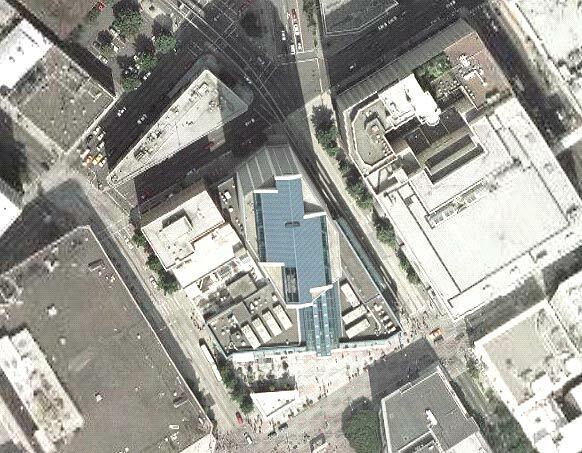 The narrowing of the dual tracks can be seen in the upper center part of this Google Maps aerial photo. 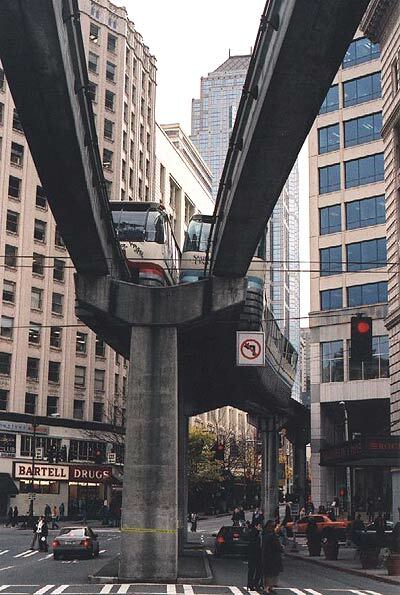 And so the Seattle Center Monorail resumed operations in 1989, but now with a new limitation/hazard. To add to the hazard, a curve in the track before the station prevents an oncoming train from seeing if the station is clear, although there is a go, no-go signal just before the track narrows. 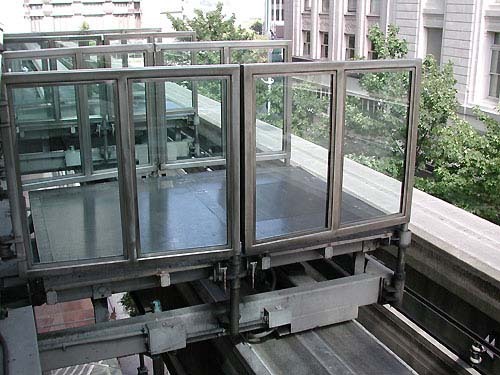 Rather than ramps between tracks or on the outsides of the tracks, as all other monorails in the world have, the Westlake Center Station has ramps that extend to the outer track to allow passengers of the Red Train to board and unboard. For the Blue Train to be in the station, the ramps must be retracted. On November 26th of 2005, two trains were operating. The driver of the Blue Train made the unfortunate mistake of losing track of where the other train was, and for some reason also didn't notice the "don't enter" signal. 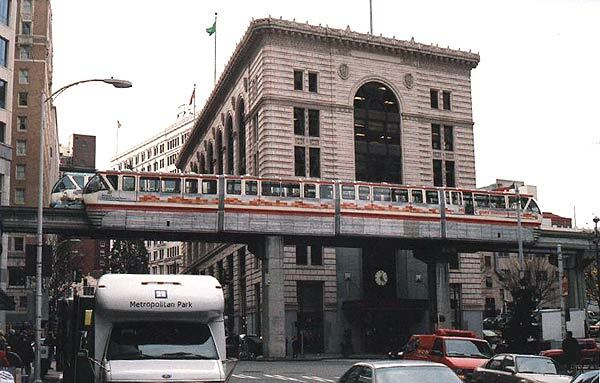 The Red Train was in the process of leaving Westlake Station. Frantic waves of the Red Train driver to the other driver were too late. Red and Blue became black and blue. The resulting scrape-together essentially locked the trains together, and passengers were evacuated by the fire department by ladder. Unbelievably, there were no serious injuries, but the accident was certainly frightening for those on board as glass broke and trains scraped together.